The concept of conditionals is when different things happen based on different conditions. When there can be multiple outcomes. At a stop light, if the light is green, cars continue to drive. If the light is yellow, cars have to decide whether to keep driving or stop. If the light is red, cars stop. If it’s raining, people use an umbrella, but they don’t if it’s not. 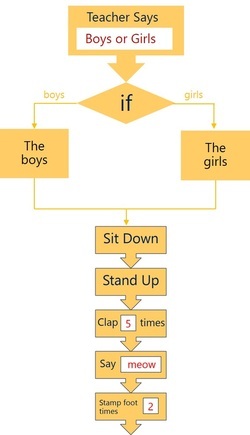 In our classroom script we could say - if the teacher says “boys”, then all the boys run the script. If the teacher says “girls”, the girls run the script. Click on the image below to access this Scratch program. You can click "see inside" to see the code.